"Saved by the Bell" was first published by The Texas Tribune, a nonprofit, nonpartisan media organization that informs Texans — and engages with them — about public policy, politics, government and statewide issues. It was almost lunch time on the day before Thanksgiving break, but Gustavo Corrales, a math teacher, was not ready to let his students out the door at the San Juan campus of IDEA Public Schools, a network of charter schools in the Rio Grande Valley. The two teachers are supposed to be rivals. Corrales works in a charter school that is publicly financed but operates independently of the Pharr-San Juan-Alamo Independent School District, where Rivera teaches. Nationally, charter schools and traditional school districts battle for students and money, and trade claims about their relative success. But here in the Valley, less than an hour from the Texas-Mexico border, the charter network and the district are working together. With IDEA in the lead, they are creating a training center for teachers and principals that will serve both charter and traditional schools. By doing so, the area is helping to write a new chapter in charter-district relations, one that replaces competition with collaboration to better serve the needs of students, regardless of which school they attend. The region joins urban districts like New York, Philadelphia and New Orleans that have developed partnerships with charter networks. Corrales and Rivera each face a steep challenge: They are expected to take hundreds of students who statistically are unlikely to graduate from high school, and prepare them for college and life. IDEA and the Pharr-San Juan-Alamo district are both growing and hiring new teachers and principals every year. The center aims to help prepare those educators for the intensity of the social and academic challenges that are endemic to a poor, rural community. The Obama administration, which has advocated for more charter schools as part of the public education solution, supports these team efforts. Earlier this year, the administration made $643 million available through Investing in Innovation grants. Some of that money promoted charter-district collaborations. In New Haven, Conn., for example, a grant awarded to Achievement First, a charter school, will place regular public school principals in charter schools for residency training. And in a collaboration outside of the grants, charter schools in Washington, D.C., which teach about 40 percent of the city’s students, signed on to the district’s Race to the Top application, agreeing to work together on designing new teacher assessments. IDEA has received nearly $5 million from the federal government, and the network has privately raised an additional $3 million to start the training center in the Valley. First-year teachers and those recruited from elsewhere will attend the center for a few weeks of training over the summer. They will also go to multiple sessions throughout the year and can call on the center for extra help. In all, about 1,200 educators will pass through the center over the next four years. Though teacher training centers have been around for years, cuts in state and local education budgets have forced some to close or reduce their services, said Barnett Berry, who heads the nonprofit Center for Teaching Quality, based in North Carolina. The intense pressure to raise test scores and satisfy demands of the Bush-era No Child Left Behind act had a counterintuitive effect — shifting spending to boosting test scores from improving teaching. In South Texas, it is particularly difficult to get high quality teachers into the classrooms where the students need them most — and teacher effectiveness is the single biggest predictor of student success, according to many education reformers. The Rio Grande Valley serves as a demographic portrait of one of the most educationally underserved populations in America: overwhelmingly poor (89 percent of the students in the Pharr-San Juan-Alamo district qualify for free meals) and overwhelmingly minority (99 percent Hispanic). How the education system handles these students has “profound implications” for the challenges that demographic change will bring on a national level, said Robert Carreon, who directs Teach For America’s program there. Most of the teachers in the rapidly growing Valley are Texas natives or from the region, like Rivera, who graduated from Pharr-San Juan-Alamo schools. The need is great, due to the continued expansion of districts like PSJA, which is one of the largest in the Valley, and the high demand for spots at IDEA, which currently has 14,000 students on the waiting list. Yet just 13 percent of adults over age 25 in the Valley have college degrees, severely limiting the hiring pool. Many South Texas students who decide to enter teacher training programs have low SAT scores. When they graduate from the teacher training and earn their certification, Fuller said, many of them have also tend to score low on certification tests. Research has demonstrated that those who had low scores are often less effective teachers. While IDEA tries to hire teachers who have at least two years of classroom experience and a record of improving classroom success, it also hires straight out of teacher preparation programs, particularly those around the state. Selectivity in both traditional and alternative certification teacher training programs is low, Fuller said. A report from the National Council on Teacher Quality found that only four schools in Texas had a strong teacher preparation program, although one was in the Valley, in Edinburg, on the campus of the University of Texas-Pan American. It’s time for that to change, said Tom Torkelson, founder and chief executive of IDEA. "All we’re doing is enshrining within our K-12 education system all the kinds of race and class inequities when we don’t ensure that every child has a great teacher,” he said. “Right now, people’s ZIP codes are the most likely indicator of whether they are going to go to college and succeed." Saved by the Bell By Morgan Smith, The Texas Tribune and Sarah Butrymowicz, The Hechinger Report December 3, 2010 It was almost lunch time on the day before Thanksgiving break, but Gustavo Corrales, a math teacher, was not ready to let his students out the door at the San Juan campus of IDEA Public Schools, a network of charter schools in the Rio Grande Valley. “I’m not going to pass you if you don’t know what to do — but it’s not because I’m being mean. I’m not being gacho,” he said, using a Mexican slang word for unkind. “It’s because I want you to learn.” Earlier that same morning, across Highway 83 at Southwest High School in Pharr, Cindy Rivera, a language arts teacher, passed out copies of Edith Hamilton’s Mythology to about 18 ninth graders. “This is a college-level book, guys,” she said encouragingly, introducing a unit on classical gods and goddesses. “The material is perfect for high schoolers. You love violence, and you love romance.” The two teachers are supposed to be rivals. Corrales works in a charter school that is publicly financed but operates independently of the Pharr-San Juan-Alamo Independent School District, where Rivera teaches. Nationally, charter schools and traditional school districts battle for students and money, and trade claims about their relative success. But here in the Valley, less than an hour from the Texas-Mexico border, the charter network and the district are working together. With IDEA in the lead, they are creating a training center for teachers and principals that will serve both charter and traditional schools. By doing so, the area is helping to write a new chapter in charter-district relations, one that replaces competition with collaboration to better serve the needs of students, regardless of which school they attend. The region joins urban districts like New York, Philadelphia and New Orleans that have developed partnerships with charter networks. Corrales and Rivera each face a steep challenge: They are expected to take hundreds of students who statistically are unlikely to graduate from high school, and prepare them for college and life. IDEA and the Pharr-San Juan-Alamo district are both growing and hiring new teachers and principals every year. The center aims to help prepare those educators for the intensity of the social and academic challenges that are endemic to a poor, rural community. The Obama administration, which has advocated for more charter schools as part of the public education solution, supports these team efforts. Earlier this year, the administration made $643 million available through Investing in Innovation grants. Some of that money promoted charter-district collaborations. In New Haven, Conn., for example, a grant awarded to Achievement First, a charter school, will place regular public school principals in charter schools for residency training. And in a collaboration outside of the grants, charter schools in Washington, D.C., which teach about 40 percent of the city’s students, signed on to the district’s Race to the Top application, agreeing to work together on designing new teacher assessments. IDEA has received nearly $5 million from the federal government, and the network has privately raised an additional $3 million to start the training center in the Valley. First-year teachers and those recruited from elsewhere will attend the center for a few weeks of training over the summer. They will also go to multiple sessions throughout the year and can call on the center for extra help. In all, about 1,200 educators will pass through the center over the next four years. Though teacher training centers have been around for years, cuts in state and local education budgets have forced some to close or reduce their services, said Barnett Berry, who heads the nonprofit Center for Teaching Quality, based in North Carolina. The intense pressure to raise test scores and satisfy demands of the Bush-era No Child Left Behind act had a counterintuitive effect — shifting spending to boosting test scores from improving teaching. In South Texas, it is particularly difficult to get high quality teachers into the classrooms where the students need them most — and teacher effectiveness is the single biggest predictor of student success, according to many education reformers. The Rio Grande Valley serves as a demographic portrait of one of the most educationally underserved populations in America: overwhelmingly poor (89 percent of the students in the Pharr-San Juan-Alamo district qualify for free meals) and overwhelmingly minority (99 percent Hispanic). How the education system handles these students has “profound implications” for the challenges that demographic change will bring on a national level, said Robert Carreon, who directs Teach For America’s program there. Most of the teachers in the rapidly growing Valley are Texas natives or from the region, like Rivera, who graduated from Pharr-San Juan-Alamo schools. 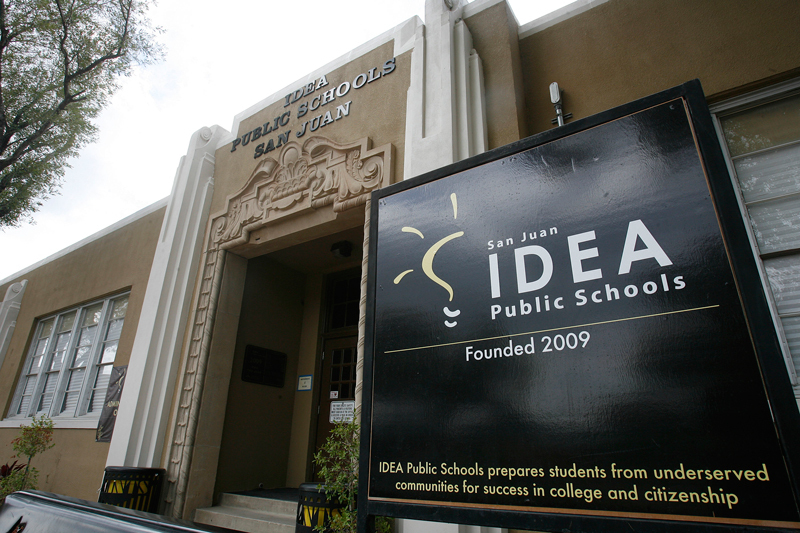 The need is great, due to the continued expansion of districts like PSJA, which is one of the largest in the Valley, and the high demand for spots at IDEA, which currently has 14,000 students on the waiting list. Yet just 13 percent of adults over age 25 in the Valley have college degrees, severely limiting the hiring pool. “South Texas really has to rely on their own homegrown talent,” said Ed Fuller, a senior research associate for the Center for Teaching Quality. “You get into this vicious cycle.” photos by: Joel Martinez/The Texas Tribune The San Juan Campus of Idea Public Schools Many South Texas students who decide to enter teacher training programs have low SAT scores. When they graduate from the teacher training and earn their certification, Fuller said, many of them have also tend to score low on certification tests. Research has demonstrated that those who had low scores are often less effective teachers. While IDEA tries to hire teachers who have at least two years of classroom experience and a record of improving classroom success, it also hires straight out of teacher preparation programs, particularly those around the state. Selectivity in both traditional and alternative certification teacher training programs is low, Fuller said. A report from the National Council on Teacher Quality found that only four schools in Texas had a strong teacher preparation program, although one was in the Valley, in Edinburg, on the campus of the University of Texas-Pan American. It’s time for that to change, said Tom Torkelson, founder and chief executive of IDEA. "All we’re doing is enshrining within our K-12 education system all the kinds of race and class inequities when we don’t ensure that every child has a great teacher,” he said. “Right now, people’s ZIP codes are the most likely indicator of whether they are going to go to college and succeed." Texas Tribune donors or members may be quoted or mentioned in our stories, or may be the subject of them. For a complete list of contributors, click here. "Saved by the Bell" was first published at by The Texas Tribune, a nonprofit, nonpartisan media organization that informs Texans — and engages with them — about public policy, politics, government and statewide issues. Link back to the original article, which is located at https://www.texastribune.org/2010/12/03/charter-and-public-schools-align-in-the-valley/.